Denny arrived in the United States to find that his recording of ‘It's The Bluest Kind Of Blues’ was riding high in popularity, and that he was known. After a brief spell aboard Dorsey’s yacht, the ‘Sentimentalist’, Denny was swept along in a rush of broadcasts and interviews. At one point Denny was featured in nine broadcasts within sixteen hours. The touring and living out of a suitcase again started in earnest, and the distances between engagements were vast. But Denny didn’t mind this time, for the rewards were great, and every new engagement was in a new and exciting place. Almost immediately upon his arrival, Denny was presented with some twenty new tunes to learn and memorise. Most, like ‘Sentimental Rhapsody’ another slow and bluesy number, were completely new to Denny. That night the Band started to rehearse them. It was a steep learning curve, but one which Denny handled well. It should be mentioned here that one of the things that made Denny a really great vocalist, was his ability to quickly memorise and retain a lyric, even years afterwards, as well as having an innate and instant feel for the lyric and for the purpose and meaning of the song itself. Denny could interpret the song and give it real warmth and feeling. Great singers and stylists can do this. They can take the most ordinary of lyrics and instil them with some quality. The ‘B’ side of ‘It's The Bluest Kind Of Blues’, a song called ‘Make Believe World’ is perhaps one such example. It was a skill that would stand Denny in good stead as occasionally he had to perform unrehearsed numbers on broadcasts. Such skills, plus Denny's talent and sheer professionalism and reliability, really impressed Tommy Dorsey and also the members of the Dorsey Band, who had seen and worked with some of the very finest vocalists of the era. One anecdotal story serves to illustrate Denny’s talent and ability. 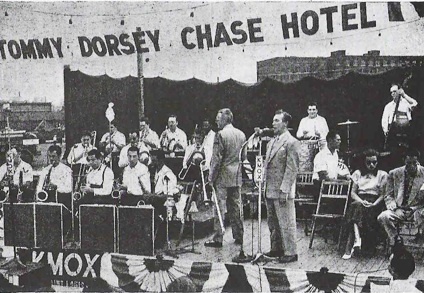 At the end of a show, Dorsey often left the bandstand slightly early, and he would put alto payer and arranger Sid Cooper in front of the band. At the end of a dance in the Chase Hotel in St. Louis, Cooper asked Denny if he knew and would sing, totally unrehearsed, the popular tune, ‘That Old Black Magic’. Denny agreed and gave a faultless performance. Spontaneous applause came not from the audience, but from the band itself, taking Denny a little by surprise. A tribute indeed. When Dorsey was told, he was impressed too, and included the number in the broadcast the following evening. “I’m a great hand for going out on a limb, but this one is pretty steady, and you can quote me: Denny Dennis is going to be one of the top balladeers of the country and soon. He is a bit of Crosby, Sinatra and Como all in one, but different enough to be hailed here and now as ‘the number one voice’. His voice and his phrasings are so right you get goose pimples on your heart. Watch that name, Denny Dennis, I think it’s going to soar”. Touring and broadcasting with Tommy Dorsey gave Denny much needed exposure. Within American popularity polls he was giving some of the top names a run for their money. 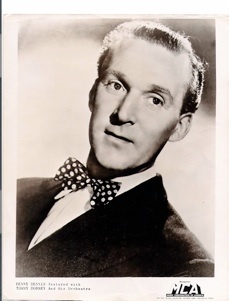 In the ‘Downbeat’ Poll of 1948, Denny came fourth in the category for a vocalist with a Big Band, beating Bob Eberly, the former popular vocalist with Jimmy Dorsey. In the Billboard Poll he came joint fourth, with the former Glenn Miller vocalist, Johnny Desmond, beating such talents as Billy Eckstine, but losing to the new emerging talents of Gordon Macrae and Vic Damone. Denny worked hard with the Dorsey band. He was the featured soloist, and he also sang many numbers with Lucy Ann Polk and the Sentimentalists. Despite the hectic tours and broadcasts, Denny had a wonderful time. Apart from appearing in such famous locations as the Café Rouge of the Hotel Pennsylvania, he was able to meet many of the stars of the period, especially the musicians for whom he had a tremendous respect. One such was the great jazz trombonist Jack Teagarden. Denny also met up with Louis Armstrong, who he had met briefly in Britain during the early 1930’s, and was surprised to find that Louis remembered him. Friendships were made that were to last for life. The singer Frankie Laine, Jack Duffy, one of the Dorsey ‘Sentimentalists’, and trumpeter Charlie Shavers were amongst them. It was all a far cry from the restrictions of wartime Britain. Unfortunately for Denny, the ‘American Federation of Musicians’ recording ban was still in operation during the time that Denny was with the Dorsey Band. The ban was coming to an end at the very end of 1948, and therefore Denny was only to make a handful of actual recordings with Dorsey. These were, ‘How Many Tears Must Fall’, ‘Down By The Station’, ‘So In Love’, ‘While The Angelus Was Ringing’, and ‘Someone Like You’ Compared to some of the broadcasts that have survived, the recordings do not show Denny’s full potential with the band. One recording in particular, ‘Down By The Station’ features Denny singing in a rather poor cockney accent, and is a title that Denny did not want to record. However, when Mr. Dorsey says do it, it’s done. The number did appear in the 1949 popular charts for a few weeks. 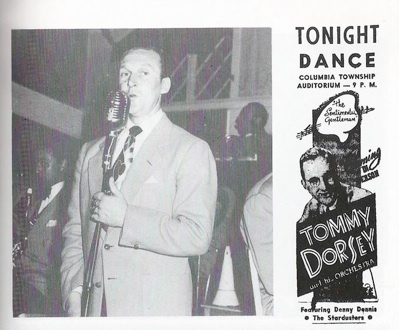 Denny was actually with Tommy Dorsey for just over a year. He was perhaps on the brink of the biggest breakthrough of his career. To be a successful star in the States, and with a public that seemed to welcome him and his vocal talents, looked a very likely prospect. Tommy Dorsey was more than pleased with Denny and would have been happy for him to stay with the band, but it was not to be. Ultimately, for personal and very pressing reasons, Denny would return to Britain in April 1949. His career was never to regain its momentum.